The PowerScore LSAT Reading Comprehension Bible Workbook™ is the ideal companion to the renowned PowerScore LSAT Reading Comprehension Bible and is designed specifically to allow you to practice the application of our methods and techniques. This book contains eight complete reading comprehension passages, reproduced in their entirety from actual past LSATs, ten individual passages, and multiple drills that focus on reinforcing the skills you need to effectively attack the Reading Comprehension section. The answer key provides an extensive breakdown and analysis of each passage, and each question and answer choice is explained. While The PowerScore LSAT Reading Comprehension Bible provides the conceptual basis for understanding and applying general strategies, The LSAT Reading Comprehension Bible Workbook is specifically designed to test and reinforce these techniques and strategies. This is not a how-to manual, but rather a traditional workbook filled with drills designed to reinforce and improve upon the specific techniques and approaches that will enable you to master the reading comprehension section of the LSAT. No Reading Comprehension question or drill in this book was used in the LSAT Reading Comprehension Bible. To help you practice the application of your Reading Comprehension skills, this book is divided into three sections: Section One: Practice Drills The first section of this workbook contains drills which test isolated analytical abilities, designed to reinforce and improve the specific skills necessary to successfully attack the Reading Comprehension section. The set of drills is followed by an answer key explaining each item. Section Two: Individual Passages The second section of this workbook contains ten individual LSAT Reading Comprehension passages. At the end of the section is a comprehensive explanation of each passage, including an expansive breakdown of each passage, a ViewSTAMP analysis, and a complete explanation of every question and answer choice. Section Three: Complete Reading Comprehension Sections The final portion of this workbook features two complete LSAT Reading Comprehension sections, followed by full explanations of each passage and every corresponding question. This section gives you the opportunity to emulate actual testing conditions, allowing you to apply the full range of reading comprehension strategies while also focusing on your pacing under time pressure. 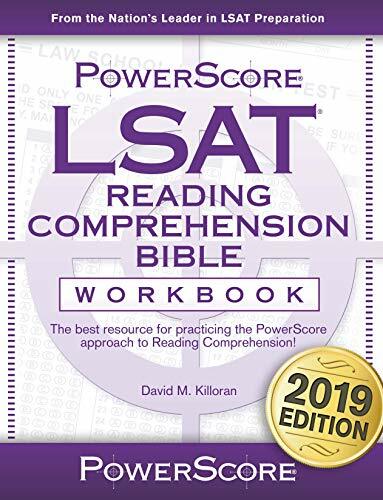 Note: If you are looking for a how-to manual, please refer to The PowerScore LSAT Reading Comprehension Bible, which provides the conceptual basis for the general strategies you will be practicing. In the discussions of passage approaches and techniques in this workbook, we will assume that you have read the PowerScore LSAT Reading Comprehension Bible and are familiar with its basic terminology.